Conferences, meetings & seminars at the heart of the border triangle Germany, Belgium, Luxembourg. The extraordinary Conference & Event Center at the location of the company Massen in the north of Luxembourg offers various possibilities for international conferences, seminars, incentives & product presentations. Integrated into a unique shopping mall with more than 25,000m² of retail space and a diverse gastronomy, the Conference & Event Center offers ideal opportunities for the special requirements of today’s world. The total area of Massen encompasses more than 100 000 m². As a recognized and active member of the MICE Cluster Luxembourg, the family business sets high standards for the quality of service and the satisfaction of its guests and hosts. Individuality and the implementation of the customer’s own standards form the basis for satisfactory success. The possibilities are as varied as the individual requirements of the customers. Examples are high-quality indoor events for 2 to 500 persons such as conferences, seminars, product presentations, kick-off events, team building activities, workshops & tastings (Wine Shop: Whiskey, wine, beer, spirits | Chocolate manufactory: Chocolate & filled chocolate | La Grande Épicerie Massen: cheese etc.). What about booking a complete shopping mall as a special highlight under the slogan « Rent a Mall » and combine this experience with the Mediterranean flair of various tasting stands? Or we organize your outdoor or open-air event at the lake located right next to the conference & event center, on the more than 20,000 m² outdoor area or in the adjacent nature conservation parc « Conzefenn ». Moreover, high-quality product presentations find their effective platform in the special event location with 1,200m² of event space and its own freight elevator for up to 5 tons. When implementing customer wishes, the in-house Conference & Event team also relies on the network of specialized companies and experienced services in the region. The credo for the organization is always that you have 1 contact person for all your needs. According to the motto « Everything from one source for your event ». Massen is conveniently located on the two main region’s national roads (N7 & N62) with direct motorway access. Luxembourg City and the airport can be reached in around 50 minutes. A train station for a comfortable journey by train and the corresponding shuttle service is offered on site. Within 90 minutes, you arrive from Aachen, Cologne, Koblenz or Brussels. Frankfurt can be reached in less than 120 minutes. 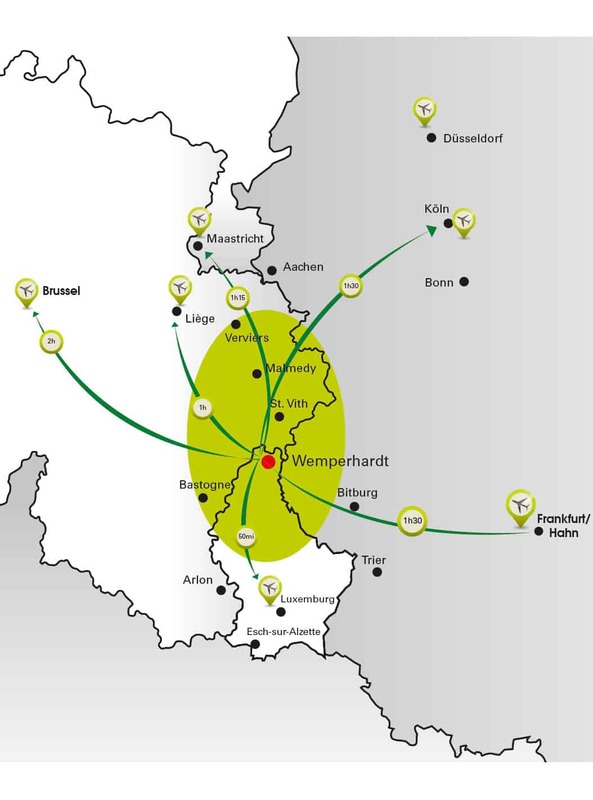 As an international business location, Wemperhardt has become a popular meeting place. More than 800 companies are located within a radius of 5 km. These include well-known and globally operating companies from the transport & logistics sector, the pharmaceutical & IT sector and the service sector. The special feature of the location is the fusion of nature and economy in a very natural landscape drawing. Directly bordered to the Conference Center is the nature reserve “Conzefenn” which is ideal for breaks and relaxing hikes. If you are looking for an even more varied nature and idyllic landscapes, the Luxembourgish Ardennes are the place for you. Likewise, the Conference & Event Center has more than 1,730 free parking spaces, underground car parks and 2 petrol stations. An important feature of the area is the multilingualism of the inhabitants. Luxembourg is very diverse. This counts for the different landscapes, carefully maintained and tended, as well as for the countless witnesses to an extraordinary and varied history of the rich cultural heritage of our country: historical castles, fortresses, museums, exhibition areas and galleries. Some of them are even part of the UNESCO world cultural heritage. From the Moselle vineyards to the rock formations of the Ardennes, from the legendary “Red Earth” in the south – witness to a rich industrial history – to the “Müllertal”, the Little Luxembourgish Switzerland, and the lovely capital with its legendary fortifications: the country offers a unique nature and countless extraordinary landscapes. Come and visit us – book “your mall” for your next event.